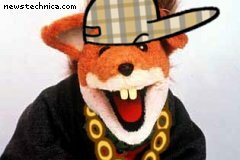 Base image: BBC promotional photo of the current Basil Brush puppet. Cap and chain from Chav.jpg by J.J., public domain. The poster asserts that the use of the BBC promotional photo is fair use under US law for purposes of political and satirical commentary.